Three years ago, I set myself the goal of standing on an Enduro World Series Masters podium. To be completely honest, I doubted myself, on many occasions. My performance in Millau and Whistler at last years EWS rounds, left me questioning why I was even putting myself through such grueling racing. With each round becoming increasingly tougher, and competing at the highest level of Enduro in the world as a lone privateer alongside the professional riders, I really didn’t think my dream would ever become a reality and I honestly felt like giving up on my dream. “Am I really cut out for this” was an internal question that seemed to repeat itself when I was pushing up near vertical tracks on the two hour liasons between stages. This is where the mental toughness of riders is really put to the test. So, with coming out of last season feeling fairly dejected from it all, I had time to reflect. I didn’t want to quit racing at this level. With some rest and regeneration, I knew that I was cut out for it. I had it in me, I just needed to prepare better. I made the conscious decision not to stress about it over any more. I got stuck into a consistent training routine over the winter, regained my confidence and focused all my attention on winning on home turf. And that’s exactly what I did. 2018 started with four wins in a row, I was feeling on top of my game, strong and fit and of course having an awesome time on my bike. 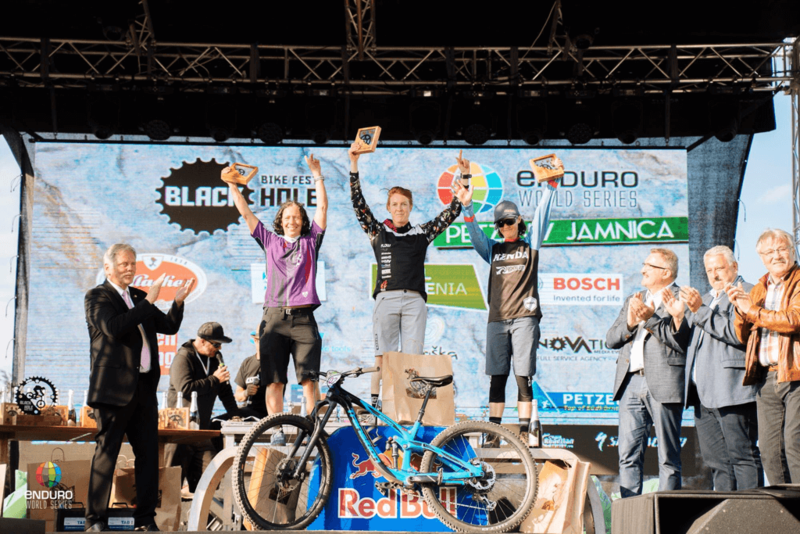 Hosted by the Blackhole Bike Festival, the fourth round of the EWS venue was, for the first time, spread across two countries – Slovenia and Austria. Both days started out at the race village in Petzen, Austria. Day 01 we pedalled across the border into Slovenia for stages 1 and 2, and back again into Austria for Stage 3. Day 2 was the same format, leading us to a different mountain in Slovenia for stages 4 & 5, with a 5km pedal underground transfer through a deactivated railway mining tunnel, then back to Petzen for the final and most epic stage, stage 6. After a long day of travelling, I finally arrived in Hober, Slovenia at 1am on Monday morning. It didn’t take me long to get used to the left hand drive after two hours maneovering along the tight, twisty turns through the Austrian mountains. I was very glad to put my head on a pillow, something that was to become a regular feeling over the course of the week!! I woke the next morning to the sound of the river outside and drew the curtains to reveal the beautiful hillside and on it a family of goats staring back at me. My usual routine during race week would be to open up the van door, but there was no ‘slumming it’ this time round, and I stepped out onto my balcony to take it all in and fill my lungs with fresh Slovenian mountain air. I spent the next hour building my Transition Bike, then headed into town to stock up on supplies in the local supermarket. By lunchtime I was at the Bikepark in Petzen, giddy to check out the race venue and to stretch the legs which were aching for a spin. I pedalled half way up the mountain and rode down the famous ‘Flow Trail’ which pretty much did what it said! The park was quiet but for the organizers who were busy doing the final preparations for the 400 racers and hundreds of spectators that were on their way. Tuesday was spent walking three of the race stages. This is something that can be really useful as it firstly shows you what your up against, and secondly, it really helps you to remember the stage, especially important sections. I chose to walk stages 1, 2 and 4. Stages 3 & 6 were almost 6km in length so I decided to conserve my energy and leave them out. It was great to hook up with Becky Cook and Thomas Lapierre from the Orbea Factory Team and walk Stage 4 with them. The trails were bone dry at this point, which was to change come practice. Wednesday was spent getting everything ready for the next 4 days. Bike, gear, spares & food. At 4pm I headed back to Petzen for registration. By this stage the whole place was buzzing with campervans, bikes and team pits were all setting up. I got a tingle of excitement as I walked passed the team pits and saw the huge stage that was being set up. On Thursday we practiced Stages 1 to 3 and on Friday, Stages 4,5 & 6. This was two big days, even with some shuttling allowed. The rain had made the tracks pretty wet and exposed the many roots lurking beneath the once dry, dusty soil. If it was to continue to rain, this was going to be one tough, technical race! In the evenings, after washing my bike, and feeding myself, I sat down to recap each stage by watching my GoPro footage, and wrote down any important features to watch out for and obvious fast lines. Knowing the tracks would change significantly over the course of the next few days, i knew they would be completely different come race day. However, remembering the tracks always was an advantage and could be the difference between winning and losing, crashing and staying smooth. Stage 01 – 2.87km length, 337m descent : From the race village in Petzen, it took us a good hour and a half pedal and hike-a-bike to get to the start of Stage 1. The stage was flat and physical, with lots of slimey roots but thankfully had dried up since practice. Stage 03 – EWS Trail Petzen 88km length, -1083m descent : Dropping over 1km in gradient this was one tough mother of a stage but it was EPIC! With such a long, physical stage, armpump was inevitable. However, you didnt have the luxury of having a break as there was literally no let-up on the physicallity of it. I caught up with a few riders ahead of me on a particularly technical section and then with the panic of it all, they crashed thus causing me to also crash! I couldnt unclip from my pedal as I was mangled in my bike and lost alot of time here. My arms were screaming towards the end, and after losing so much time with the crash, I pushed as hard as I could, giving it everything I had until I crossed the finish line. Result: My first stage win! It had been a really tough day with over 6 hours on the bike. The liasons between the stages were really hard and long. What kept me going was focusing my attention on not squashing any insects as I plodded up the hills, singing whatever song came into my head and keeping my heartrate in the ‘Green’ Aerobic Threshold Zone. For any of you sports science geeks, for me, thats anywhere between 140 – 150bpm. Day 01 done, currently holding 2nd place! ​Stage 04 ‘The Ridge’ 2.38km length, -515m descending : I woke up feeling pretty fresh considering I’d had three long days on the bike and with the first race day being so tough. I was eating well and sleeping well, the key to getting through an EWS! Today was by far a better day on the bike with three awesome stages that were just so much fun to race. After the long 1.5 hour pedal and a really steep and long hike up to stage 4, we were treated to an absolute belter of a track. The sun had come out and dried it up so it was now back to what it was purpose built for – loamy goodness! I felt super on this stage and although I caught some riders in front again with some time lost, I managed to take my second stage win! Stage 05 – Lost Goat 1.96km in length, -412m in descent : After an insanely tough push up to stage 5, as well as the 25minute pedal through the mine, I was glad to have time to rest before dropping into this stage. I had another super run here. It was shorter than the rest of them and suited me as it was pretty similar to what I ride back home. I really enjoyed this stage, my Sentinel 29er flew and I held nothing back. I was to get my 3rd stage win on this one. Stage 06 Thriller 6.05km length : This was probably, up there with one of my best race runs EVER in my biking career! I had nothing to lose, i was comfortably in 2nd place and was leading by just 11 seconds. I didnt set out to win the EWS but this was the point that I actually believed that it could be possible. All I had to do was ride smooth, stay clean and enjoy it, which is exactly what I did. I felt absolutely amazing througout this epic stage and couldnt believe how good the bike felt on this long, flat out track with its fast loamy sections and technical roots. It had dried up nicely so that it was just brilliant to race on. Coming over that finishline, I hugged my fellow competitors and that when I heard the announcement made that I had won! 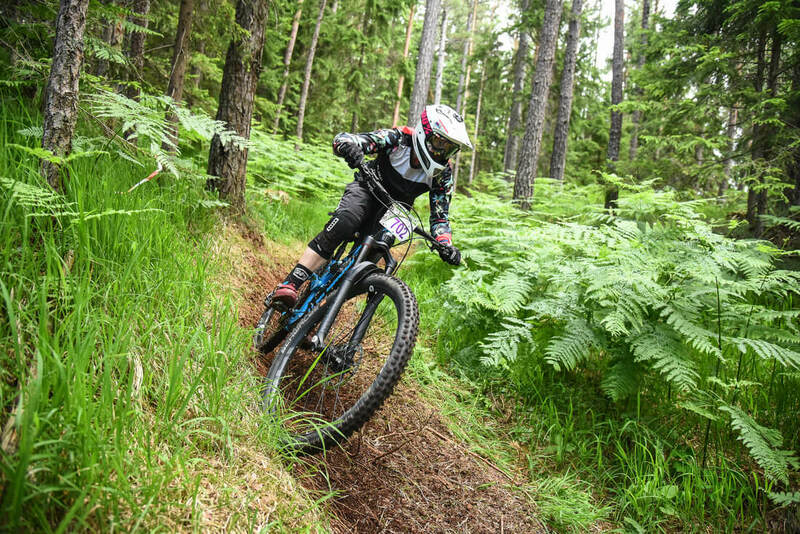 By a margin of just three seconds to Trek Gravity Girls rider Birgit Braumann. The amazing Mary Mcconnloug finished 3rd and held onto her overall series leader. She is truely an inspirational woman. It’s to put into words how much this means to me and how fantastic it feels to achieve what I thought was unachievable. It wouldnt have been possible either only for the fantastic Enduro race structure we have in Ireland that has brought not only me on as a rider, but also so many other Irish and enabled us to compete against the best in the world! Thank you to everyone for all the words of support and messages, it really makes a massive difference to my mindset leading up to the race, while racing and when im struggling up those badass 2 hour climbs! Huge shout out to @Fit4Racing who have kept me strong and fit over the season with their Enduro specific programmes. The Bike Rack Dublin for putting me on seriously the best bike I’ve ever ridden and keeping it in mint condition! A Transition Carbon Sentinel 29er. WTB for their awesome tyres. And finally to my team, Flow MTB who’ve kept me in the best kit I could ask for!